The 4Single Table Frame is a height adjustable frame for kitchens. You are able to decide which tabletop you prefer to go with it. The height adjustable frame gives you the possibility to create a kitchen table precisely according to your preferences in size and worktop material. You can use the 4Single Frame as a work table, dining table or kitchen table in diasability friendly kitchens. It is highly suitable for wheelchair users as there are no crossbars that impede wheelchair entry under the table. You can choose either manual or electrical height adjustment. Furthermore, the table can be adjusted to both standing and seated users. 4Single Frame gives you the freedom to create a kitchen table that fits the individual needs. At the same time, it has the flexibility and accessibility that people with limited functional capacity need. With a 4Single Frame, you get a height adjustable and high-quality table frame for your kitchen table where you get the freedom to choose which tabletop you would like on top. The frame has a matte dark grey surface and an elegant design that matches modern kitchens in private homes, sheltered accommodations and institutions. You decide what tabletop you would like, which means you can get precisely the table you would like for your kitchen. The frame offers you the possibility to get a kitchen table that looks like an ordinary table but has the necessary features that make everyday life easier for people with mobility disabilities. You can, for example, adjust the table height to make it fit both standing and seated users. Wheelchair users have free access to the table since there are no crossbars under the table. As standard, the table frame is manufactured 4mm smaller than the tabletop itself which is the normal overhang that provides a good edge to hold on to. If desired, the overhang can be made larger or smaller but please remember to note this when you order. The frame is made to fit both smaller dining tables and larger kitchen tables. It is available for tabletops from 60-300 cm long and 60-300 wide. That means you can choose exactly the size that suits the individual kitchen and user’s needs – and you can be sure to get a product in the quality which ROPOX is known for. If you need a large kitchen table or refectory table, standard tables are often not long enough, and it can be difficult to find tables in that size which are handicap friendly. The 4Single Frame makes it possible to get exactly the size you need as well as the functionalities that people with reduced functional ability require. 4Single Frame is available in two different height adjustment ranges: 55-85 cm and 65 -95 cm. The height adjustment makes the table suitable for both standing and seated usage. 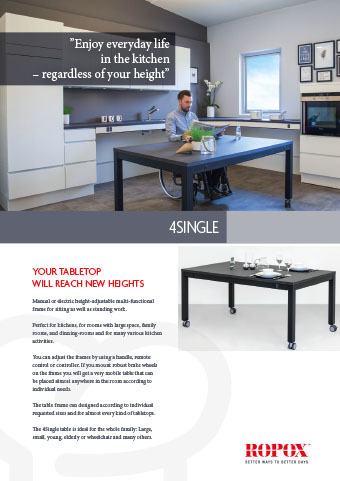 It is easy to raise the table to a comfortable work height when a user would like to stand up, or you can lower it to a suitable level for seated users. You can also choose between manual and electrical height adjustment. On tables with manual height adjustment, you set the height with a handle that is easy to mount and adjust. Electrically height adjustable tables are set via a control switch that is located on the front fascia of the table. This only requires a light push on a button to raise or lower the table. If you would like to avoid cords getting in the way, you can also choose a battery solution where the height is set with a remote control, and there are no cables or cords needed. 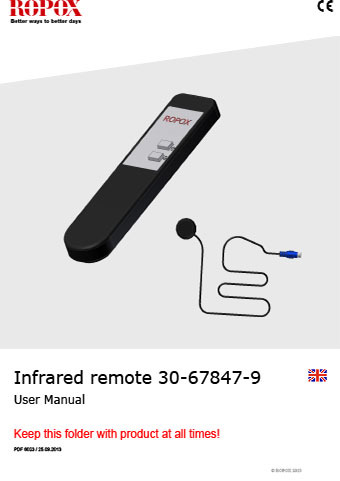 The battery solution can be an advantage to people with limited mobility as the remote control can follow the user around, and the user does not have to be within reach of the control switch to set the height. Our products are of course manufactured according to the relevant standards regarding assistive aids. That means they comply with the requirements for durability, safety, and quality and you can be assured that it is safe and secure to use the kitchen. 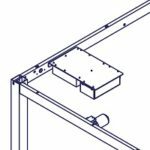 For example, the frame with electrical height adjustment has a built-in safety stop, which makes the table stop immediately if it senses that anything is in the way when it is raised or lowered. That way you have peace of mind and be certain that the table can stand the daily use. The simple and elegant kitchen table frame can be used as a dining or kitchen table in private homes or sheltered accommodations. It is also suitable for kitchens and dining rooms at special schools, nursing homes and other institutions that need assistive aids for elderly and disables people. If you choose to mount brake wheels on the frame, you get a flexible table that can be moved around. That way the table can be used for several purposes. 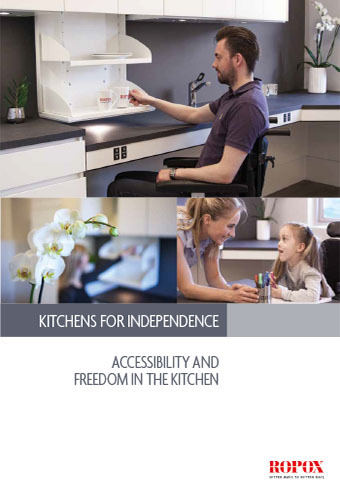 In short, it is an ideal table for kitchens for people with limited mobility because it is flexible enough to be used for many different tasks and purposes. If cabinets or drawers are to be mounted under the worktop, then it is possible to get extra reinforcement. If side panels are to be mounted, brackets may be mounted. If the table need to be mobile, it is possible to add solid brakewheels. They are easy to operate. If the table shall be fixed to the floor. We always recommend to install safety strips on electric frames to reduce the risk of trapping. The safety strip is easily mounted on the fascias and goes through the legs for a perfect finish. The safety strip is available in different sizes depending on the size of the frame. Standard load on 4SingleElectric is 150 kg evenly distributed. If a higher load is needed we offer up to 250 kg. When ordering frames this is free of charge. For existing 4Single Tables/Frames an upgrade kit with a complete set of legs will be needed. To avoid cables hanging it is possible to add a battery to the frame. Complete solution incl. control box. Since the control box is a part of the electrical frame the control box will be reducted from the price. Charging: The battery have to be charged by a micro USB cable, 5V DC and 2.4A. This is not included. Please note: This solution cannot be combined with safety strip. The kit consist of elbows, universal trap, flexible waste pipe, intersection, crossings and 2 feed pipes 100 cm. The frame is 4 mm smaller than the worktop as standard. Frames are ordered according to the size of the worktop. If the overhang shall be larger – please contact Ropox.